The story is that Huawei used to simply buy Cisco routers, break them down and build knock off replicas. They were rubbish. From there, the Chinese equipment maker moved on, to making good quality knockoffs and from there moved into actual R&D and started building its own. I don't know how true that is, and I don't know how to verify or bust that particular myth. But I do know that Huawei has come from a wannabe to the main contender in terms of network deployment in the space of one generation of mobile phone services. In the 2G world there were three competitors: Nokia, Ericsson and Alcatel. Lucent was a trailing fourth and there were others, of course, but predominantly it was a Scandinavian market with some French thrown in for comic relief. Even in the 3G world both Ericsson and Nokia reigned supreme. Alcatel and Lucent merged (just as Spark how that went, but be prepared for a lengthy and drunken conversation) but couldn't really bring the big guns to bear. Locally, Vodafone deployed on Nokia and Spark (then Telecom) chose Alcatel-Lucent for its shiny new GSM-based 3G network. 2Degrees, however, went with the newcomer - with the formerly unremarkable Chinese equipment maker, Huawei. At the time, Huawei had not built a national network for any telco so 2Degrees was a bit of a showcase for the company and in the space of a decade the New Zealand arm of Huawei grew from about 25 people to 250 people, working away at all levels of the business, not just as a sales and marketing arm for the mothership. Then came 4G and Huawei took over the world. According to its Wikipedia page, in 2010 80% of the world's top 50 telcos used Huawei kit, including Spark and 2Degrees. And that's just in the mobile space - Vodafone used Huawei to upgrade its cable network in Wellington and Christchurch and Ultra Fast Fibre chose Huawei for its leg of the Ultra Fast Broadband network rollout. Huawei is embedded in New Zealand's telco sector like no other company. Now, with the GCSB's concerns about Huawei's deployment in Spark's 5G network all that is up in the air. The GCSB has turned down Spark's proposed network development plan as it can do under the Telecommunications (Information Capability and Security) Act (TICSA) and it's up to Spark to either come up with a mitigation plan or move on. The problem for Spark, and for Huawei, is that coming up with a plan, getting it approved by the GCSB or sending it up the food chain to the Minister for approval (as is the process) is going to take time, and Spark doesn't have that luxury. Spark has promised to turn on 5G for the America's Cup and that's fast approaching. Easier to find a new partner and jump in boots and all. The GCSB hasn't disclosed what its concerns are, but they potentially centre on the idea of Huawei building the core capability of Spark's 5G network. Huawei's role in the 4G and 3G networks for both Spark and 2Degrees has been around the edges - building the RAN devices and yes, the routers in our homes and the phones in our hands. Building the core might be a step too far for the GCSB. But Huawei already ruled that out - saying they would not bid for Spark's core network assets and would work with whichever partner Spark (and 2Degrees) came up with. Which pretty much rules that out as the issue. Whatever the problem, from a technical point of view Spark, and presumably 2Degrees when it goes cap in hand to the GCSB, will have to find a new partner and that is going to be very interesting. The network landscape is not what it was. Nokia has Vodafone as a client, but not a lot else going on. Ericsson has largely vanished from the market, and nobody will touch Alcatel-Lucent after the debacle of Telecom's XT network launch, first in its interference with Vodafone and 2Degrees and then when the network fell over repeatedly. That leaves the industry in something of a pickle. Either they chose Nokia or an untested newcomer. ZTE would face similar geo-political issues as Huawei, and there's really only Samsung but they're quite untested at this level. But of course, that's only half the story. The other half is one of geopolitical manoeuvrings and of the kinds of trade disputes only George Lucas can love. Huawei is a Chinese company, set up by a man who used to be in the Red Army and presumably still has ties with the government (or so the thinking goes). He belongs or belonged to the Chinese Communist Party and so *obviously* is a threat to New Zealand's position on the political board. Except China is our largest trading partner, we've spent the better part of the last 20 years courting China, we have a free trade agreement with China and a number of our prominent politicians have been actively engaged with Chinese businesses and their move into the New Zealand market for some time now. So trade wise, we're Team Dragon and long may it last. Politically, however, we're aligned with the grouping I'll call "the West", with the remnants of the Commonwealth and with the United States and they're opposed to all that China stands for (except cheap goods, of course, and even then there are some issues). The US and Australia (motto: "we're just like America but with a funny accent") have been very concerned about China's growing influence in the region for some time now and have been grumbling about New Zealand's seeming lack of backbone when it comes to standing up to the growing Chinese influence. Allegedly, the US has stepped this up in recent times, putting more pressure on New Zealand to stand up and be counted or risk… well, who knows what. While the GCSB says it hasn't had any pressure put on it by US counterparts - and I believe that wholeheartedly - that's not to say political pressure hasn't been brought to bear on our political lords and masters outside the GCSB. Still, it's hard to see what the US could do because we don't have a free trade agreement with the US, we've just had tariffs slapped on any steel exports (do we even export steel?) and the US only imports around $US5 billion in goods from us each year. We export nearly $NZ15 billion to China by way of comparison. We're not even part of a defence alliance really - ANZUS is pretty much toast after our non-nuclear stance (although that has thawed in recent times) and while we send troops and support to various wars around the place, we're not exactly under a great deal of threat ourselves, so defence ties are more of a social good (but with guns) than anything else. Of course, the US could kick us out of our cosy intelligence gathering alliance - the Five Eyes - and that might be a problem. The US-led intelligence group includes New Zealand, Australia, the US, Canada and the UK. It's a bit odd because the UK is really part of the EU and we're down here in the Pacific and the only real thing bringing us all together is that we used to be part of the Empire - the whitest part that speaks English. But share information we do (except when it suits the US not to, such as that time Boeing was bidding against Airbus for a big contract and the US decided Boeing had to win regardless) and not being part of that club would send a Clear Signal To Our Allies That We Aren't To Be Trusted etc. So the US and Little US would like us not to side with China on pretty much anything and that includes the building of telco networks. All of which leaves New Zealand a little exposed. Do we side with our intelligence alliance partners or do we side with our largest trading partner or do we tell them all to stick it and go our own way? That's well above my pay grade, but it's an issue that needs to be resolved and not just because of our telco networks. It needs to be resolved because unless the West starts buying more goods off us, we've got far more to do with China than ever before - and that relationship is growing. Given the way the US is at the moment, eventually we'll have to decide on which side our bread is buttered and "eventually" may be sooner than we are really comfortable with. 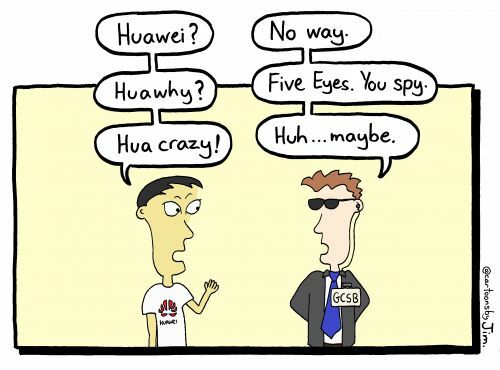 So, without clear evidence from the GCSB (or indeed, from any spy agency anywhere at any time) about the problem they have with Huawei equipment, we're left to speculate as to what the issue might be. Clearly they're concerned that Huawei will be able to hack into our networks, see our valuable intellectual property and to tell Beijing all about it, but is that really the situation? And if it is, why aren't we seeing concerns raised about the 3G and 4G networks, never mind the UFB? The concerns seem to break down into two main camps - hacking of information and listening in is the most obvious, and frankly I'd be surprised if the Chinese weren't already doing this. After all, the Americans and the Brits do it, and we help them, and surely all our major trading partners do this and frankly we should just assume everyone is able to and act accordingly. Our state secrets might not seem like much in the grand scheme of things (butter prices, milk solid ratios, house prices in Auckland) but they're ours and when you add in the intellectual property we're starting to deploy, we probably do want to keep these things secret and on our terms. But there's nothing about the 5G network deployment (as far as I can tell) that is going to suddenly make this a priority for the GCSB. No, I suspect it's something related to the deployment of 5G itself that has set the alarm bells ringing. The only thing I can think of is the internet of things (IoT) and the looming demand for every device we own to become a connected device. While most of the IoT focus is on domestic appliances and the consumer home market, the real issue is more about what happens when we put power stations, hydro-dams, treasury IT systems and the like online. What if Beijing could use the network one day when it gets bored and decides to turn off our access to electricity until we meet its demands? I have a few problems with this scenario. First of all, is that really something any government would do? I mean, it's all well and good in theory but why bother? And secondly, I reported on Y2K and this argument reminds me of the breathless reporting about nuclear power plants and the like that we saw at that time. OMG, went the theory, the nuclear power plants won't be able to tell 1999 from 2000 and will shut down and melt through the planet's core and we're all going to die! I rang a lot of core infrastructure providers in New Zealand at that time to find out what the chances were of any of that happening. Zero, they all said. New Zealand is so "backward" that none of our core infrastructure is on the internet. Indeed much of it isn't even digital. It's mechanical and electrical. I remember the chap from the company that looks after traffic lights telling me not to worry about Y2K or hackers because the lights are controlled by mechanical switches and are quite unhackable. So if that's the concern, I think we can put it to bed. But of course, the GCSB is operating under the cone of silence and so we may never find out what the reasons are for this decision. "I remember the chap from the company that looks after traffic lights telling me not to worry about Y2K or hackers because the lights are controlled by mechanical switches and are quite unhackable." Which of course was 20 years ago, and a bit has changed since then. 5g is unlike 4g in that it will replace 3g (by carrying voice traffic as data) and quite possibly much of what we think of today as 'broadband'. It will be at the heart of our national connectivity and probably carry pretty much all voice and data traffic between locations. That would put a backdoor in a position to affect, yes, electricity supply, banking (and hence food and fuel), medicine, emergency services, the lot. The UK government has just calculated the impact of WannaCry on just the National Health Service as UKP 92m (which probably ignores the human cost of missed treatment). I think it's pretty reasonable to put some obstacles in the way of even a hypothetical threat this significant. Probably a slight oversight Paul, but I'm sure you're aware that Alcatel-Lucent is now Nokia, and has been since Nokia Networks bought them out about 2 years ago now. Thanks Simon, I did know that... somewhere in the edit process my past tense became present which is pants.